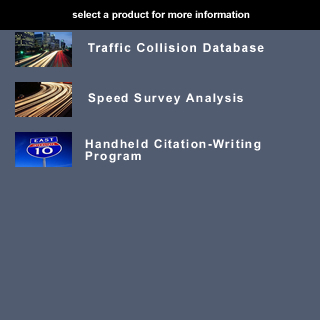 Crossroads Software, Inc. produces powerful, easy-to-use database solutions for traffic records and citations. In addition to records management, our systems offer rich, complex analysis, querying and reporting, GIS mapping, and other features. Select a product by clicking on one of the links at the left. If you are interested in our Traffic Collision Database, you can download the product brochure by right-clicking here and selecting "Save Target As" (tcdsbrochure.pdf; 6.6MB). The brochure is in PDF format and requires Adobe Acrobat Reader. If you do not have Acrobat Reader, go here to download it for free from Adobe. You are welcome to contact us directly if you want more information about our products and services.